Endoscopic technology has allowed surgeons to look at traditional methods of treating vascular diseases with an eye toward innovation. The Skull Base Institute has pioneered Endoscopic Brain Aneurysm Clipping, revolutionizing the way that vascular surgery is performed with less disruption of normal brain tissue, less painful recovery, and a rapid return to daily activities. A cerebral aneurysm is an abnormally dilated segment of a blood vessel surrounding the brain. In some cases, the entire blood vessel widens and expands resembling a balloon-like structure. Cerebral aneurysms are said to occur in 3-5% of the general population, are more common in patients older than 30, and are almost twice as common in women than men. Nearly ¼ of all cerebrovascular deaths are due to ruptured aneurysms. The annual incidence of cerebral aneurysm rupture is approximately 7/100,000 persons. The peak incidence of aneurysm rupture occurs around age 50 – 60, although rare cases may occur in children and patients over 75. The risk of aneurysm rupture is approximately 0.05 – 2% per year depending on the size and characteristics of the aneurysm. The exact cause of many cerebral aneurysms is not completely clear. In general, aneurysms are thought to arise from a weakened area in the wall of a blood vessel. Some aneurysms may occur as congenital defects in the lining of blood vessels in the body; resulting in continued aneurysm enlargement throughout one’s lifetime. There appears to be a familial component to the development of aneurysms, as they are much more common in first degree relatives, especially siblings. On rare occasions, multiple occurrences are reported. Several factors can induce weakening of the blood vessel wall including: infection, trauma, brain tumor, and arteriovenous malformation (abnormal blood vessel development). Factors, which have been shown to increase the risk of aneurysm rupture include: smoking, excessive alcohol consumption, and arteriosclerosis. Occasionally, an enlarging aneurysm can cause symptoms through the compression of surrounding neurologic structures (i.e. visual changes, seizures, facial pain, etc). Unfortunately, symptoms frequently do not appear until the aneurysm has ruptured. The rupture of a cerebral aneurysm is usually sudden and occurs without any warning. Symptoms of a ruptured aneurysm may include any of the following: loss of consciousness, severe headache with nausea or vomiting, stiff neck, difficulty moving any part of the body, numbness or decreased sensation in any part of the body, blurred vision, drooping eyelids, seizure, and/or a change in mental status. Once an aneurysm ruptures, blood accumulates between the brain and the subarachnoid space (a thin wall surrounding the brain), thus resulting in a subarachnoid hemorrhage (SAH). As blood collects in this space, it compresses and damages the surrounding brain tissue. The tissue injury Causes the surrounding blood vessels to be susceptible to vasospasm. Vasospasm is an abnormal constriction of the blood vessels of the brain, which can result in additional tissue damage through diminished blood flow to the brain. The combined effect of bleeding and vasospasm can result in serious neurologic impairment or even death. A thorough neurologic exam is performed to assess mental status and determine specific deficits. In the past, examination of the cerebrospinal fluid provided evidence of bleeding in the subarachnoid space. Today, 3-dimensional spiral CT angiography or magnetic resonnance angiography (MRA) of the brain are the standard tests used to diagnose cerebral aneurysms. Video x-rays of blood vessels using injected dye (Cerebral Angiography) provides even more detailed images of the blood vessels in the brain, often visualizing the exact location of the aneurysm. Cerebral aneurysms, once ruptured require urgent medical attention. The goal of treating patients suffering from rupture of a cerebral aneurysm is to control the immediate symptoms and prevent further bleeding. Upon arrival to the hospital, a patient’s vital signs, such as respiration, blood pressure and circulation are stabilized. Depending on the location, size and extent of bleeding the Neuroradiologist using catheters similar to the ones used to perform the cerebral angiogram can occasionally occlude the aneurysm and stop the bleeding using small metal coils or other inert material (endovascular embolization). However, this method only achieves adequate aneurysm occlusion in 50-70% of patients. Either due to aneurysm size, location, or inadequate endovascular embolization many ruptured aneurysms require immediate surgical intervention. 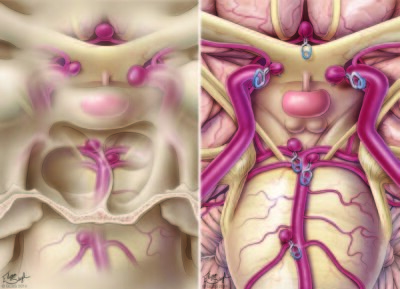 The goal of the operation is to place a surgical clip at the base of the aneurysm to control the bleeding and eliminate the risk of re-bleeding. Standard supportive treatments following aneurysm rupture include: bed rest, mild sedation, medications to prevent seizures and help reduce vasospasm. A Doppler ultrasound device is used to monitor the degree of vasospasm. Complications such as re-bleeding, severe vasospasm, and brain swelling are the major causes of morbidity and mortality after aneurysm rupture. About 15% of patients with ruptured aneurysms die before reaching the hospital, whereas an additional 20-40% do not survive despite the very best in current medical care. Therefore, early diagnosis and proper treatment are crucial for a good prognosis. Research has shown that several factors contribute to an improved prognosis including: an effective patient transfer system, rapid diagnosis with immediate access to CT/MRI imaging, 24 hour availability of highly qualified surgeons familiar with both the surgical treatment of cerebral aneurysms/SAH as well as the most modern medical treatment both pre- and post-operatively. To avoid the devastating consequences of aneurysm rupture, surgeons often recommend surgical clipping or endovascular embolization of asymptomatic aneurysms.